The Georgia Bulldogs football program represents the University of Georgia in the sport of American football. The Bulldogs compete in the Football Bowl Subdivision (FBS) of the National Collegiate Athletic Association (NCAA) and the Eastern Division of the Southeastern Conference (SEC). They play their home games at historic Sanford Stadium on the university's Athens, Georgia, campus. Georgia's inaugural season was in 1892. UGA claims two consensus national championships (1942 and 1980); the AP and Coaches Polls have each voted the Bulldogs the national champion once (1980); Georgia has also been named the National Champion by at least one polling authority in three other seasons (1927, 1946 and 1968). The Bulldogs have won 15 conference championships, including 13 SEC championships (tied for second-most all-time), and have appeared in 55 bowl games, tied for second-most all-time. The program has also produced two Heisman Trophy winners, four number-one National Football League (NFL) draft picks, and many winners of other national awards. The team is known for its storied history, unique traditions, and rabid fan base, known as the "Bulldog Nation". Georgia has won over 800 games in their history, placing them 11th all-time in wins. Georgia has won six (1920, 1927, 1942, 1946, 1968, 1980) national championships from NCAA-designated major selectors. Georgia claims both the 1942 and 1980 national championships. 1920 – First-year head Herman Stegeman led the program to its second undefeated season, outscored opponents 250–17. 1927 – Georgia's famous Dream and Wonder team led by George Woodruff went 9-1. This team was noted for having a win over 1920s power, Yale, in Connecticut. Georgia was ranked #1 going into its final game against rival Georgia Tech, where they were upset 12-0 in the rain. Even so, Georgia finished the season ranked #1 in two minor polls. 1942 – Georgia was chosen as champion by at least half of the recognized polls. Georgia was led by All-Americans Frank Sinkwich and end George Poschner, along with a young back named Charley Trippi. The Bulldogs knocked off 9 consecutive opponents and ranked No. 1 in the nation. Georgia earned a Rose Bowl bid after it blanked Georgia Tech 34–0 in Athens to end the regular season. Georgia then edged UCLA 9–0 in the Rose Bowl. 1946 – Fueled by the return of Charley Trippi, the 1946 SEC Champion Bulldogs went 10-0, including a 20-10 win over North Carolina in the Sugar Bowl. Notre Dame finished the season ranked #1 in the majority of the polls, but the Williamson poll recognized Georgia as #1. 1968 – The 1968 Bulldogs won Vince Dooley's second SEC Championship as head coach, and finished the season undefeated. However the 8-0-2 Bulldogs tied twice, and then lost to Arkansas in the Sugar Bowl. The Litkenhous poll recognized them as National Champions. 1980 – The Bulldogs beat Notre Dame 17–10 in the Sugar Bowl to finish 12–0 and claim the National Championship. Notable contributors during the season included Herschel Walker, Buck Belue, and Lindsay Scott (Georgia was listed first by AP, Berryman, FACT, FB News, FW, Helms, National Championship Foundation, NFF, Poling, Sporting News, and UPI). Georgia has won a total of 15 conference championships, ten outright and five shared. The school's 13 Southeastern Conference Championships rank it second all time in SEC history, tied with Tennessee behind only Alabama. Georgia has won nine SEC Eastern Division championships, and has made seven appearances in the SEC Championship Game, most recently in 2017. The Dawgs are 3–4 in those games. Twice, in 1992 and 2007, Georgia was the Eastern Division co-champion, but lost a tiebreaker for the right to appear in the championship game. The Bulldogs have played in 55 bowl games, tied for second all-time. UGA has a bowl record of 31–20–3. Their 31 wins rank the Dawgs third all-time in bowl wins. They have played in a record 17 different bowls including appearances in five of the New Years Six Bowl Games (2 Rose, 3 Orange, 3 Cotton, 5 Peach and 10 Sugar Bowls) and an appearance in the 2018 College Football Playoff National Championship. The Georgia Bulldogs would sound good because there is a certain dignity about a bulldog, as well as ferocity. After a 0-0 tie with Virginia in Charlottesville on Nov. 6, 1920, Atlanta Constitution writer Cliff Wheatley used the name "Bulldogs" in his story five times. The name has been used ever since. "Between the Hedges" Legendary sports writer Grantland Rice coined the term that famously describes the home of the Bulldogs in the 1930s in reference to the famous English privet hedges that have surrounded the Sanford Stadium turf since its inaugural game against Yale in 1929. The original hedges were removed in 1996 in preparation for the women's soccer matches hosted at Sanford Stadium for the 1996 Centennial Olympic Games. Offshoots of the original hedges were planted shortly after the games. The Hedges also serve as a crowd control measure, as they contain a fence inside of them. In fact, only once have Georgia fans been able to rush the field, that following a victory over Tennessee in 2000. Uga (pronounced UH-guh) is the name of a lineage of white Bulldogs which have served as the mascot of the University of Georgia since 1956. 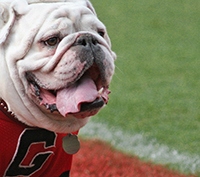 The current mascot, "Que", officially took the role of Uga X on October 23, 2015, shortly before Uga IX, or "Russ", died after four years serving as the mascot. Deceased Ugas are interred in a mausoleum near the main entrance to Sanford Stadium. Georgia is the only school to bury its past mascots inside the football stadium. Glory, Glory is the rally song for the Georgia Bulldogs and was sung at football games as early as the 1890s. The rally song was arranged in its current form by Georgia professor Hugh Hodgson in 1915. While "Glory, Glory" is the most commonly played Georgia song, the school's official fight song is "Hail To Georgia" which is played after field goals. The ringing of the Chapel Bell after a Georgia victory started in the 1890s when the playing field was located near the Chapel and freshmen were compelled to ring the Chapel's bell until midnight to celebrate the victory. Today, freshmen are no longer required to do the chore, with students, alumni, and fans taking their place. "The Battle Hymn of the Bulldog Nation" is a slowed down version of The Battle Hymn of the Republic arranged in 1987 and is a hallowed song played pregame and postgame by the Redcoat Band. A lone trumpeter in the southwest corner of Sanford Stadium plays the first few notes, after which the entire band joins in and a video montage, narrated by longtime Georgia radio broadcaster Larry Munson, is played that highlights the many great moments of Georgia football history. It is custom for fans to stand, remove their hats, and point towards the lone trumpeter as he plays the initial notes. This tradition is considered the climax of the Redcoat Band pregame show and was introduced before the 2000 season. "How 'bout them Dawgs" is a slogan of recent vintage that first surfaced in the late 1970s and has become a battle cry of Bulldog fans. The slogan received national attention and exposure when Georgia won the national championship in 1980 and wire services proclaimed "how 'bout them dogs". Silver britches – When Wally Butts was named head coach in 1939, he changed the uniform by adding silver-colored pants to the bright-red jersey already in use. The "silver britches" became very popular, and were a source of multiple fan chants and sign references over the years, the most well-known being "Go You Silver Britches". When he was hired in 1964, Vince Dooley changed Georgia's uniform to use white pants, but reinstated the silver pants prior to Georgia's 1980 national championship season. Georgia's use of the "silver britches" continues to the present day. The "Dawg Walk" is a tradition that features the football players walking through a gathering of fans and the Redcoat Band near the Tate Student Center as they enter Sanford Stadium. Vince Dooley began the tradition, originally leading the team into the stadium from the East Campus Road side. Ray Goff changed the Dawg Walk to its current location in the 1990s, but eventually discontinued the practice altogether. Mark Richt revived it starting with the 2001 season, and it continues to the present day. Georgia's standard home uniform has not significantly changed since 1980, and consists of a red helmet with the trademarked oval G, red jerseys, and famous silver britches. Wally Butts first introduced the "silver britches", as they are colloquially known, in 1939. When Vince Dooley became Georgia's head coach, he changed the team's home uniform to include white pants. The uniform was changed back to silver pants prior to the 1980 season, and has remained silver ever since. Georgia's earliest helmet was grey leather, to which a red block "G" logo was added in 1961. The shirts were usually red, sometimes with various striping patterns. Their uniforms in the pre-World War II era varied at times, sometimes significantly. Photographic evidence suggests that black shirts, vests, and stripes of various patterns were worn at times over the years. Vince Dooley was the first to incorporate a red helmet into the uniform in 1964, adopting the oval "G", a white stripe, and white facemasks. Anne Donaldson, who graduated from Georgia with a BFA degree and was married to Georgia assistant coach John Donaldson, was asked by Dooley to come up with a new helmet design to replace the previous silver helmet. Dooley liked the forward oriented stylized "G" Donaldson produced, and it was adopted by him. Since the Georgia "G" was similar to the Green Bay Packers' "G" used since 1961, Coach Dooley cleared its use with the Packers organization. Nonetheless, Georgia has a registered trademark for its "G" and the Packers' current, redesigned, "G" logo is modeled after the University of Georgia's redesign of Green Bay's original "G" logo. The helmet change was part of a drastic uniform redesign by Dooley, who also replaced the traditional silver pants with white pants that included a black-red-black stripe. The jerseys remained similar to the pre-1964 design, however, with a red jersey and white numbers. Prior to the 1980 season, the "silver britches" were re-added to Georgia's uniform with a red-white-black stripe down the side. Since the 1980 season, Georgia has utilized the same basic uniform concept. The sleeve stripes, trim colors, and font on Georgia's home and away jerseys have varied many times, but the home jerseys have remained generally red with white numbers, and away jerseys have remained generally white with black numbers. The most recent trim redesign occurred in 2005, when sleeve stripe patterns were dropped in favor of solid black jersey cuffs on the home jersey and solid red cuffs on the away jersey. Matte gray pants have also been used at times instead of "true" silver since 2004, mainly because the matte gray pants are of a lighter material. One of the things that make Georgia's uniform unique is its relative longevity, and the fact that it has very rarely changed over the years. There have been occasions, however, when alternate uniforms have been worn. Red pants were used instead of silver as part of Georgia's away uniform at various times during the 1980s. Black facemasks and a white-black-white helmet stripe were worn during the 1991 Independence Bowl. Black pants were used instead of silver as part of Georgia's away uniform during the 1998 Outback Bowl and home uniform during the 1998 Florida game. Black jerseys were worn instead of red as part of Georgia's home uniform in games against Auburn and Hawaii during the 2007 season, in 2008 against Alabama and in 2016 against Louisiana-Lafayette. A unique away uniform was worn against Florida in 2009. This uniform included black helmets with red facemasks, a white stripe, and the traditional oval "G" logo; white jerseys with black numbers; and black pants. The Bulldogs have three main football rivals: Auburn, Florida, and Georgia Tech. All three rivalries were first contested over 100 years ago, though the series records are disputed in two cases. Georgia does not include two games from 1943 and 1944 against Georgia Tech (both UGA losses) in its reckoning of the series record, because Georgia's players were in World War II and Georgia Tech's players were not. Georgia also includes a game against one of the four predecessor institutions of the modern University of Florida in 1904 (a Georgia win) that national sportswriters and Florida's athletic association do not include. 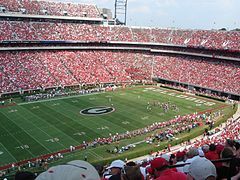 Georgia has long-standing football rivalries with other universities as well, with over 50 games against five additional teams. Since the formation of the SEC Eastern Division in 1992, Georgia has had an emerging rivalry with the Tennessee Volunteers. The Georgia–South Carolina football rivalry has been a game of increasing importance since the Gamecocks joined the SEC in 1992. The Bulldogs have had 74 players selected to the All-America team through the 2017 season. :182–187 Through the 2017 season, there have been 32 consensus selections of which 10 were unanimous. While several players were selected in more than one year, only Frank Sinkwich, Herschel Walker, David Pollack, and Jarvis Jones were selected as consensus All-Americans more than once. Two former Georgia players have been inducted into the Pro Football Hall of Fame. Seventeen former Georgia players and coaches have been inducted in the College Football Hall of Fame. In addition, one former player, Pat Dye, has been inducted into the Hall as a coach for Auburn. Georgia plays Auburn as a permanent non-division opponent annually and rotates around the West division among the other six schools. Larry Munson – "The Voice of the Bulldogs", Georgia football play by play announcer from 1966 to 2008. ^ a b "Sanford Stadium". Retrieved March 7, 2011. ^ University of Georgia Hard Goods Logo Guide (PDF). August 30, 2017. Retrieved December 2, 2018. ^ "College Football Data Warehouse - Division I-A ALL-TIME WINS rankings". Archived from the original on April 6, 2004. Retrieved October 10, 2018. ^ "Southern Intercollegiate Athletic Association Conference Champions". Cfbdatawarehouse.com. Retrieved September 28, 2011. ^ 2017 NCAA Football Bowl Subdivision Records (PDF). Indianapolis: The National Collegiate Athletic Association. July 2017. pp. 111–114. Retrieved January 24, 2018. ^ "Championships/Honors/Awards". University of Georgia Athletics. ^ "Yearly National Championship Selections". cfbdatawarehouse.com. ^ "Who has the most SEC football championships?". ^ "132+ Teams in 132+ Days: University of Georgia Bulldogs • /r/CFB". ^ a b c "Georgia Traditions". UGA Athletic Association. Archived from the original on January 18, 2013. Retrieved January 12, 2013. ^ "Uga IX, 'Russ', passes". Georgiadogs.com. CBS nteractive. Retrieved January 23, 2016. ^ a b c d e f "Georgia Football 2011 Media Guide". Georgiadogs.com. Archived from the original on October 16, 2011. Retrieved September 28, 2011. ^ UniformCritics.com, Photos of 2007 Georgia Bulldogs Black Jersey. Retrieved July 19, 2013. ^ UniformCritics.com, Photos of 2009 UGA Bulldogs Alternate Away Uniform. Retrieved July 19, 2013. ^ UniformCritics.com, Photos of 2011 Georgia Bulldogs Nike Pro Combat Uniform. Retrieved July 19, 2013. ^ "ESPN.com: NCF – Here's a toast to Florida-Georgia". ^ "Punter-turned-kicker lifts Florida over Georgia in OT". ^ "Greatest college football rivalries – FOX Sports". ^ "2018 Media Guide" (PDF). georgiadogs.com. Georgia Athletics. ^ "Consensus All-Americans by Schoo" (PDF). ncaa.org. NCAA. p. 20. ^ "Pro Football Hall of Famers". www.profootballhof.com. Pro Football Hall of Fame. Retrieved April 20, 2018. ^ "Pat Dye To Enter College Football Hall Of Fame". ^ "Georgia Bulldogs Football Schedules and Future Schedules". fbschedules.com. Retrieved July 28, 2017. Dooley, Vincent J. (2014). "History Now: A Year Like No Other: Football on the University of Georgia Campus, 1942". Georgia Historical Quarterly, Autumn 2014, Vol. 98, Issue 3, pp. 192–216.